An emphatic win from a hugely committed and dedicated team, only briefly sums up last Thursday nightâs Championship win for our U16 panel in Mayfield. We headed to Mayfield with a strong panel and an even stronger army of supporters to play Ballinora in the Rebel Og East U16C Hurling championship. We started with Gavin O Neill in Goal, who again had a superb game. Gavin has been consistent throughout this championship campaign and Thursday night was no different. Peter Hegarty and Eoin O Neill played in full back positions and both had an excellent game. Leon Doocey, met his match marking one of the Ballinora half forwardâs but followed him tirelessly into full forward throughout the match, not leaving much room for play. Meanwhile Conor Mc Carthy, playing consistently as he has through the entire season, controlled the defence impeccably and took some great frees, resulting in excellent points. Peter Roche, was his solid self, continuously leading his marker into full forward and making sure of possession for the majority of play. Richard Morrison, played some excellent hurling and got some great balls into the forward line especially through the second half of the game. David Morrison, again, another consistent player, worked diligently throughout the entire game. Shane Cotter, a great point taker, scored some excellent points from play. Shane Flynn, having had a good first half, played a great second half with his work rate coming to fruition scoring a couple of great goals and points from play. Jack Kenny, likewise, had a great goal and again great points from play. As in previous matches, we made four substitutions in the second half, ensuring all the subs got some action in the game. With Declan Morrison replacing Peter Hegarty, Seamus Morrison for Richard Morrison, Declan Geary for Shane Flynn and Stephen Casey came on for Shane Cotter, these boys certainly didnât leave the side down ensuring a resounding win, when Dave Daly blew the final whistle. Finishing on a score line of Castlelyons 5-14 Ballinora 2-06, the boys deserved all the praise and glory on this magnificent night. Congratulations to our hard working management team of James O Neill and Mark O Flynn, along with a backroom staff comprised of Henry Hegarty, John Flynn and Pat O Neill. Itâs without doubt their excellent guidance and dedication, has had a very positive impact on this panel of players throughout the year. There were jubilant scenes from the pitch as the Rebel Og East Chairman, Liam Shanahan, presented the exquisite Rebel Og cup to our dedicated captain Peter Roche. Of course a final thank you must to go the supporters and parents who again, didnât fail to impress on the night with the loud shouts of encouragement from the side lines. The boys wouldnât be where they are today, without the unfailing commitment from parents and we as a committee, know how lucky we are to have such great support in Castlelyons. The next hurdle for these young lads, is a County Semi Final against a formidable Doneraile side, who have had some comprehensive wins over St Dominicâs and Clyda Rovers to date in their campaign in the Rebel Og North Cork U16C Hurling Championship. This match is due to be played on Saturday August 6th with time and venue to be confirmed so keep an eye on our twitter feed and Facebook page for updates. We wish James O Neill, his management team and the players all the best in the County Semi Final. 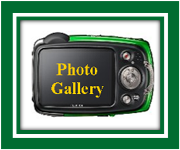 Our U10s suffered their first defeat of the Hurling League to a very good Kilworth side on Wednesday 27th July. Confidence was high with our lads after some great performances to-date, but Kilworth struck early for a few goals. We struck back with a well taken goal by Sean O'Callaghan, followed by a great long range point from Jack Cremin. Our lads continued to work very hard but it was Kilworth who took their chances and struck again for another brace of goals. As the game went on we improved and there were some great points taken from out the field by Olan Lenehan and Jack. Paddy Dooley and Tom O'Neil moved to the back line with great effect and now Eoin McMurtry was up forward starting to win a lot of possession. A close in free from Eoin was finished to the net by Olan but time had run out with Kilworth winning on score line of 7-4 to 3-7. Full team on the night was Kevin Barry, Cathal O'Riordan, Eoin McMurtry, Sean O'Callaghan, James McAulliffe-Barry, Olan Lenehan, Jack Cremin, Tom O'Neill, Ruairi Counihan, David Hegarty, and Patrick Dooley. The U9s also travelled to take on Kilworth in a challenge game and more than held their own on the night. Adam Lardner showed some great touches and Jack Reals in the midfield worked tirelessly well supported by all who played. The U9 team on the night was, Richard Barry, Torin O'Brien, Adam Lardner, Jack Reals, Jack O'Connor, Jack Burke, Lee Ryan, Dylan Leetch, Oisin Cronin and Sean Og Maguire. Training continues every Saturday and Wednesday and our next outing for both U9s/10s is a home game V Ballyhooly on Saturday August 13th. Our U14 Footballers take on Carrig Na Bhfear this Thursday night, August 4th, in the Rebel Og Football Championship in Carrigh Na Bhfear. Kick-off is at 7.30 and it would be great to see our many supporters there on the night to cheer the lads along. We wish John Mc Carthy, his management team and most importantly, the players, the best of luck on the night. Our Minor panel take on Cobh this Thursday night, August 4th in the Minor B Football Championship in Cobh. Kick-off is at 7.30 and it would be great to see the Castlelyons Supporters Army out in force to support the boys on the night. We wish Shane Hickey, his management team and all the players the best of luck on the night. We are back this week with a lotto jackpot of â¬ 3,000 and tickets can be purchased in McDonnellâs, Coolagown, The Abbey Tavern Castlelyons, Murphyâs Vehicle Repairs, Sharonâs Hair Design, Fitzgerald Butchers Fermoy and from the usual ticket sellers and promoters. We would like to thank everyone for their continued support with the lotto, which is a vital source of income for our club. 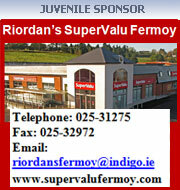 SuperValu have been a fantastic sponsor to the Juvenile Club down through the years and we would urge all our players and parents to support local and support Riordanâs Supervalu.